There's this bright yellow thing in the sky. I think I vaguely remember it but it's been so long since I've seen it....oh, wait, I remember...it's the SUN! Can you believe it - we have had a day without rain and the sun is shining! Ok, I know it's still only 2:45pm and it still could rain sometime today but at least it's been really nice out so far! Since it's bright and sunny out (even though it's still cool), I thought I would share a bright floral card with you today. I love Hibiscus flowers! They are so bold - large and colorful! Now I can't grow them but I do appreciate those who can...but at least I can have the image right? 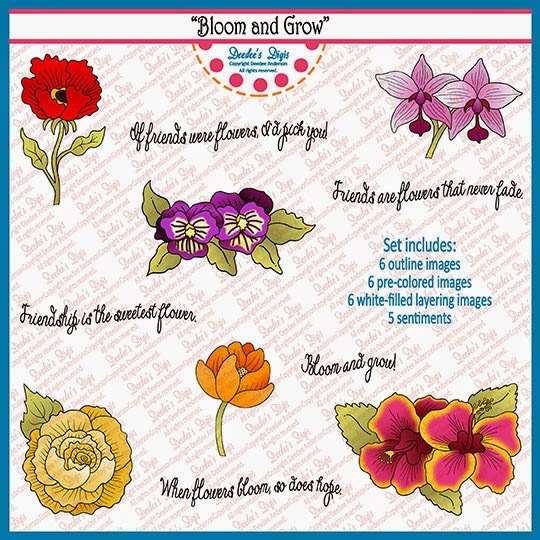 Deedee's Digi's has a beautiful set called "Bloom and Grow", I used the Hibiscus flower from the set and colored it with Spectrum Noir & Bic Sharpie markers. Of course I had to do a Google search to find images of Hibiscus flowers to pick a color pattern I wanted. Now I'm the first to admit that my coloring skills are not the best. Others can do such pretty shading but I'm just more a basic color type person. But I really do like how the red and yellow merged on this. I first colored the yellow stamen and outside petal edges with a Sharpie - then the red with the Spectrum Noir. Once I was done, I went back over the edges where the yellow and red met with the Sharpie and tried to pull some of the red into the yellow. To my surprise - some actually did pull! While my coloring isn't the best, my photography is even worse - LOL! - so the pic isn't the best...but trust me, it did pull some and I like the effect. Isn't that a wonderful set??!! If you like that one - you should check out her other sets!!! (But be prepared to want one of everything...LOL!). 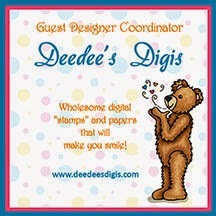 While I am talking about Deede's Digi's - did you know that there is a monthly challenge? And guess what? It's using a featured set every month - but once you participate and with the feature set - you get the next month's set FREE! What a deal huh? Thank you for stopping by today! God bless you!!!!!! Pretty card, Zella! Love all of the color. Hi, Zella! Love Deedee's images and this hibiscus is fab! Thanks for joining us at the Tuesday Throwdown challenge this week! Hope you will play along with us again soon! ohhh those are my fave flowers!!! very pretty!!!! sooo glad you played along with Cards In Envy!!!! Beautiful, bright and cheery card! I love your flowers and the embossing! Thanks for sharing with us at Cards in Envy! We have a new challenge starting today, hope you will join us again! Such a beautiful card creation. Beautiful bright colors. Awesome! Thanks for playing along with us at Scrap It girl! thank you for taking part in the Stamping Dragon Challenge with us. Very pretty card. I love the bright colors. Thanks for playing along with us at Scrap It Girl. This is such a bright and beautiful card! Thanks for joining us over at Scrap It Girl! Beautiful project. Thank you for joining us over on Stamping Dragon.